Forty-three years after the U.S.-supported military coup in Chile, the Central Intelligence Agency continues to withhold information on what it knew about planning for the putsch, and what intelligence it shared with President Richard Nixon, according to redacted documents posted today by the National Security Archive. 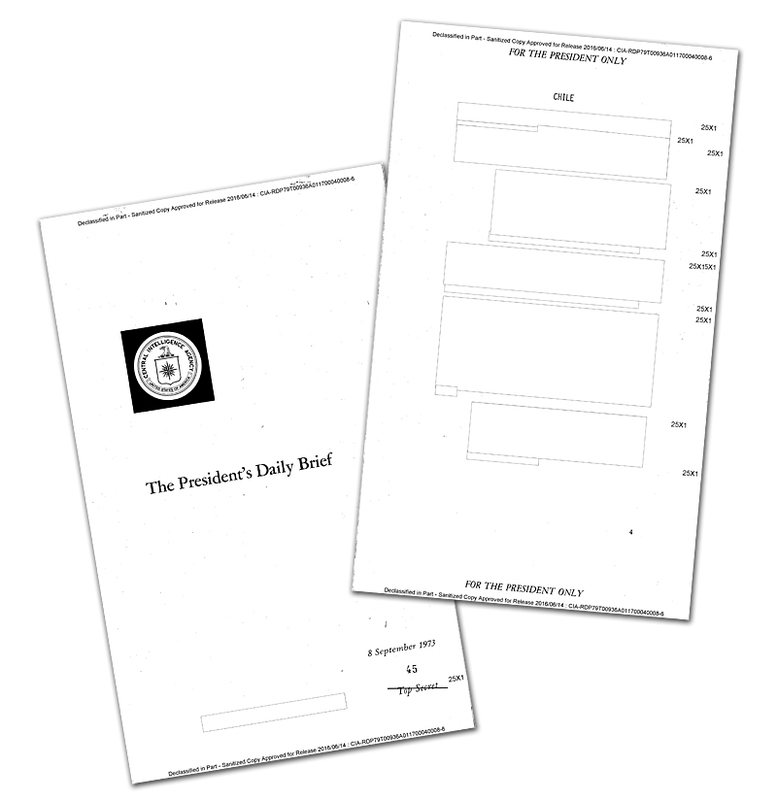 The documents, among the hundreds of President’s Daily Briefs (PDBs) the CIA declassified last month, excise material that almost certainly has already been released to the public years ago. 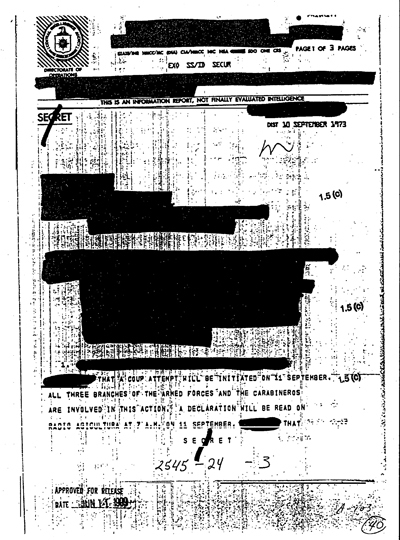 The section on Chile of the PDB dated September 11, 1973, for example, was completely censored, as was an entire page on Chile provided to Nixon on September 8, 1973, even though thousands of once-sensitive intelligence records from the coup period have already been declassified since at least 1999. The National Security Archive today called on the Obama administration, which has prided itself on historical transparency, to revisit the CIA’s determination to withhold the records. Kornbluh said the Archive would also use mandatory declassification procedures to press for the full release of the censored documents. A full-page briefing to the president about Chile on September 8, 1973, remains entirely censored. **A Defense Intelligence Agency summary, dated September 8 and classified “Top Secret Umbra,” that provided detailed information on an agreement among the Chilean Army, Navy and Air Force to move against Allende on September 10. **A CIA Intelligence cable, dated September 8 and classified “Secret,” stating that the Chilean Navy would “initiate a move to overthrow the government of President Salvador Allende in Valparaiso at 8:30am on 10 September,” and provided detailed information on which branches of the military and police would seize control of which strategic locations. The cable identified key Chilean officers and officials who had signed on to support the coup. In 1999, the Clinton administration declassified Devine’s cable along with 23,000 other formerly secret records as part of a special declassification project on Chile; the National Security Archive has posted it for the first time today. Under the Obama administration, in October 2015 the CIA began declassifying the President’s Daily Briefs, a set of intelligence records provided to presidents that former CIA Director George Tenet claimed could never be released publicly “no matter how old or historically significant it may be.” The CIA’s decision to process the records came eight years after the Ninth U.S. Circuit Court of Appeals, in response to a FOIA lawsuit brought by the Archive and Professor Larry Berman, refused to create a “per se status exemption for PDB’s,” leaving them subject to future Freedom of Information Act requests. On the day of the military coup in Chile, the CIA presents intelligence information on the progress of efforts to overthrow Salvador Allende to President Nixon. The information remains entirely redacted in this document. Three days before the coup, the CIA provides President Nixon with a full page of intelligence on preparations in Chile to overthrow Allende. The information given to the President is likely to be drawn from intelligence reports sent by the CIA and the DIA from Santiago that day. The information provided to Nixon, however, remains entirely censored by the CIA. This highly classified intelligence report provides detailed information on an agreement among the Chilean Army, Navy and Air Force to move against Allende. Sources in Chile told U.S. military officials there that the target date for the coup was September 10. In this report from the CIA station in Santiago, the CIA’s sources among the coup plotters provide information that the Chilean Navy will lead a coup from Valparaiso in the early morning of September 10, and then the other branches of the military will join in. Sources tell the CIA that General Augusto Pinochet is in communication with Air Force General Gustavo Leigh about the planned coup effort. This cable was written by a CIA operative in Santiago, Jack Devine, based on information from a source close to the Chilean military. Devine identifies the new date of the planned coup, September 11, and confirms that all three branches of the Chilean armed forces, along with the police, “are involved in this action.” In his memoir, Good Hunting, Devine writes that the cable was labeled CRITIC [Critical Information] for urgency and distributed to top officials in Washington, including President Nixon. The CIA transmits to the White House confirmation of the forthcoming coup from a “key officer” as well as his request for U.S. assistance if the military encounters resistance. The request arrives at the White House on the actual day of the coup. No direct U.S. support proved to be necessary; the request was never acted upon.